Everytime I go home to Michigan I get to visit my favorite studio, Citizen Yoga. Last time I was able to go home was Thanksgiving, and I was lucky enough to go to the studio for a class with Sitara Bird. She has always been one of my go-to yogi's when it comes to inspiration, so I always feel honored when the stars align and I can pracitce alongside her when I'm visiting. 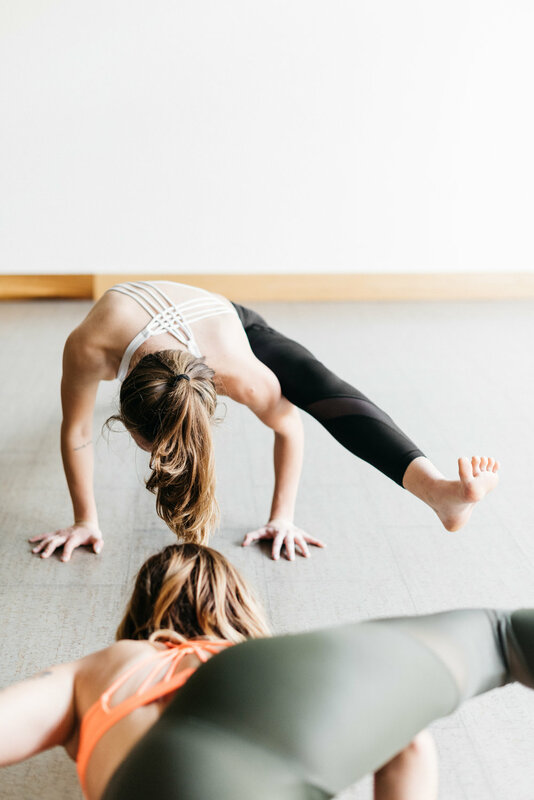 This time around I got to hangout with Sitara afterwards to learn a little more about her yoga story and have Evan Davies capture some beautiful photos. The fact that I could sit an talk with one of my sources of inspiration was incredible in itself, but her words are what really touched my heart. I know they will touch yours. What was the moment you knew yoga was going to be your escape? After my first class, I was hooked. The practice redirected me towards a glimmer of light, rather than wallowing in my shadow. That first glance was like love at first sight. I didn't know how yoga was going to help me, but I knew I had to keep practicing. What is the biggest thing you are challenged with most in your practice? Over the years, the answer to this question has changed. Currently, my biggest challenge is dealing with my hypermobility. As I prefaced in the previous question, I initially was infatuated with yoga. My commitment grew to practicing six days a week. Lately, I'm lucky if I practice thrice. Hypermobility is a sneaky suspect that is always looming near and most of the time, you have very little warning when it will strike. Having TOO much space is a real issue. Now I complement my yoga with barre and even though I am not practicing nearly as much as I used to, I still have heaps of space and I feel stronger than ever. What is your proudest moment as a yogi? Any opportunity to witness growth within a student. To see their face light up because of that "ah-ha" moment. What do you consider to be your yoga story? I stumbled into a donation based class, held at someone's loft in Eastern Market. I was an angsty, all-or-nothing, vulnerable 19-year-old with a snarky attitude who had way too much emotional baggage. I carried that energetic darkness with me, wearing it like it defined me. I didn't know any other way to exist. Yoga provided me a platform to feel vulnerable and work through my own shadow. It taught me confidence, patience and how to release the reigns on my expectations. It allowed me to process traumatic experiences that had been gnarled uptight like dried roots in my body. After witnessing how powerfully it turned my life around, I knew my mission was to help facilitate other people finding healing. So what is your yoga story, wildflower? I challenge you to dig a little deeper in your practice and look beyond the surface level. Look beyond nailing a new pose because at the end of the day, your practice and willingness is what truly matters. Sitara has opened up yet another door in my yoga practice, and I hope this piece has done the same for you. P.S. If you ever get to Michigan, make sure you go to one of Sitara's classes at Citizen Yoga.